Everybody wants an easier way commute, but have you thought about starting your drive just 10 minutes earlier? Don't believe it could change your commute? Well, News4's Adam Tuss traveled around the region to compare some known trouble spots. *Use the slide to see each area before and after. On the left is the Capital Beltway's Outer Loop near Landover, Maryland, at 9 a.m. On the right, the same area, just 10 minutes earlier. 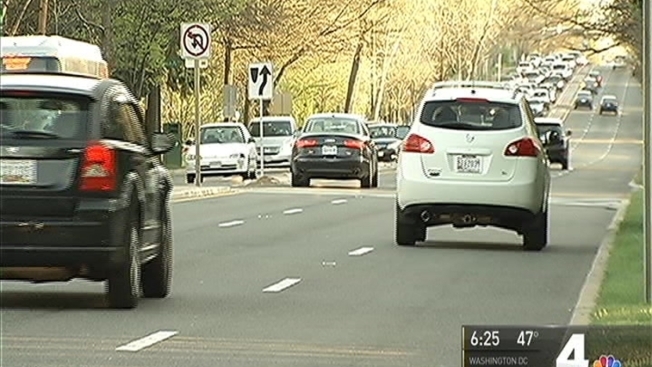 This is Rockville Pike at about 7:30 a.m., compared to 7:20 a.m.
Now, check out Connecticut Avenue in Chevy Chase, Maryland, at about 8 a.m. The same area just 10 minutes earlier is free-flowing. John Townsend with AAA says the 10 minute change could help you "take charge" of your commute. But making that change can take some preparation. "It's setting the alarm earlier and then also preparing the night before," Townsend said. "That 10 minutes can make all the difference in the world." Still not a believer? Let's try one more. On the right, you'll see the off ramp to Route 7 in Tysons, Virginia. On the right, traffic is moving freely just 10 minutes earlier. At the very least, starting your commute 10 minutes earlier could help take some of the extra stress out of your morning.